Melt the butter with the olive oil in a large skillet over medium heat. Add the garlic; saute until the garlic islightly golden, about 3-4 minutes. Increase the heat to medium-high and add the shrimp. Cook the shrimp until they are just pink, 1 to 2 minutes. Season with salt and add the parsley and lemon juice. Cook 1 minute more and serve. Place shrimp and scallops in a bowl. Add the oil, salt and pepper, parsley, garlic, and hot sauce. Stir to coat the seafood with the other ingredients. Put the bread crumbs on a plate or piece of wax paper. Add the seafood to the bread crumbs and mix thoroughly. Spear the shrimp and scallops alternately on 12 to 15-inch skewers. Grill over charcoal, on an electric or gas grill, or under a preheated broiler. Cooking time will vary depending on the size of the seafood and heat of the grill. 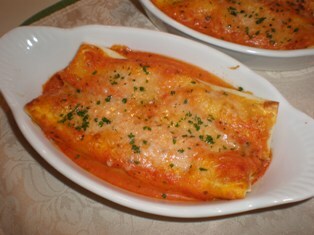 Seafood is done when it is lightly browned and cooked through. Place spiedini on a serving platter. Combine lemon juice and melted butter and drizzle over seafood. Serve with lemon wedges. Heat olive oil in a large saucepan over medium heat. Add the onion and fennel. Sauté for 15 minutes, until the vegetables are tender. Add the garlic and cook for 1 minute. Add the tomatoes and cook for 15 minutes, stirring often. Season with salt and pepper. Add pine nuts and capers and cook for 10 minutes. Arrange the shrimp on top of the sauce. Insert the bay leaves among the shrimp. Drizzle the lemon juice over the top. Cover and cook for 3 to 5 minutes, until the shrimp are cooked through. Remove and discard the bay leaves. Transfer to a serving platter. Distribute the basil and parsley over the top and serve. Pat scallops dry with paper towels. Season them with salt and pepper. In a large skillet, heat oil over medium high heat. When the oil is hot, add the scallops. Cook the scallops until golden brown on both sides, about 2 minutes per side. Don’t overcook the scallops or they will get tough. Remove the scallops to a plate and set aside. Add a tablespoon of oil to the skillet if it is too dry. Add the shallots and fennel to the skillet. Cook over medium heat for 2 minutes. Add the garlic and cook 1 more minute. Remove the skillet from the heat and add the Sambuca. Return the pan to the heat and allow the liqueur to reduce a little. Add the orange zest, orange juice, and wine. Simmer until slightly thickened, 3 to 5 minutes. Stir in the butter and chives. Return the scallops to the skillet and cook just long enough to heat. Transfer to a platter and serve. Butter an 8-inch square baking dish or individual scallop shells. If you are using scallop shells, place them on a baking sheet. Cut scallops in half crosswise. Season the scallops with salt and pepper; place in the baking dish. Melt butter in a small skillet. Add the shallots and sauté until tender, about 2 minutes. Stir in Marsala and bring to a simmer. Stir in lemon juice and season with salt and pepper. Pour the mixture over the scallops. Sprinkle almonds over the top. 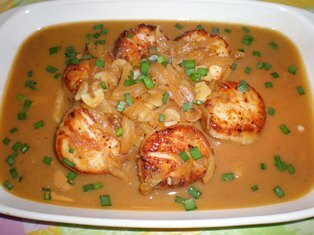 Bake 12 minutes or until scallops are opaque and almonds are lightly browned. Serve with lemon wedges. Gambero (GAHM-beh-roh) is the Italian word for shrimp. There are many different varieties of shrimp and prawns in Italian coastal waters. The smallest are the gamberetti, smal lpin kor brown shrimp which are usually boiled and served simply dressed with olive oil and lemon juice as part of an antipasto. 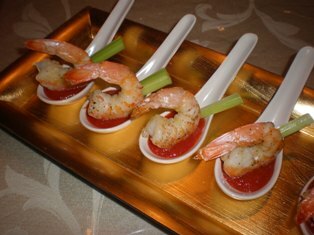 Next in size come the gamberelli, pink prawns with a delicate flavor. These are the prawns most commonly used in fritto misto di mare, or mixed fried seafood. Gamberi rossi are the largest variety of prawns. They are highly prized for their strong flavor, and are eaten plainly cooked and dipped in a bowl of mayonnaise. Best and most expensive of all are the gamberoni, large succulent prawns from the Adriatic. Make mouthwatering baked seafood, pasta, lasagna, cobblers and more with this Rachael Ray oval baker set. Their shallow sides let the tops of your culinary creations crisp to perfection. Extra-wide handles help you keep a safe, secure grip while serving. Includes 2 butter warmers, 2 shellfish crackers, 6 seafood forks/scoops.